Clinical Trials at a Glance! Read more about Clinical Trials, about their phases as phase I-IV, as well as their types as Randomized Clinical Trials. There are two main types of trials or studies – interventional and observational. Interventional trials aim to find out more about a particular intervention, or treatment. People taking part are put into different treatment groups so that the research team can compare the results. Observational studies aim to find out what happens to people in different situations. The research team observes the people taking part, but they don’t influence what treatments people have. The people taking part aren’t put into treatment groups. Some trials are Randomized Clinical Trials. This means the people taking part are put into one of the treatment groups at random. Doing this means the results are more reliable. A randomized controlled trial (RCT) is a way of doing impact evaluation in which the population receiving the programme or policy intervention is chosen at random from the eligible population, and a control group is also chosen at random from the same eligible population. It tests the extent to which specific, planned impacts are being achieved. In an RCT, the programme or policy is viewed as an ‘intervention’ in which a treatment – the elements of the programme/policy being evaluated – is tested for how well it achieves its objectives, as measured by a predetermined set of indicators. The strength of an RCT is that it provides a very powerful response to questions of causality, helping evaluators and programme implementers to know that what is being achieved is as a result of the intervention and not anything else. • a factorial design, in which a third treatment arm receives both interventions A and B. In situations where an existing intervention is in use, it is more appropriate for the control group to continue to receive this, and for the RCT to show how well the new intervention compares to the existing one. 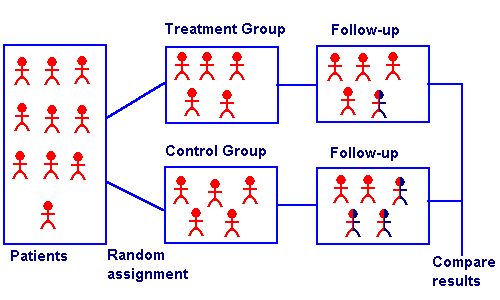 In a simple Randomized Clinical Trials (RCT), the unit of analysis for the intervention and for the random assignment is the same. For example, when evaluating a programme that provides nutrition to individuals, individuals might be randomly assigned to receive nutritional supplements. For both practical and ethical reasons, however, it is more usual to use a cluster Randomized Trial’s design, in which the unit of assignment contains multiple treatment units. For example, education interventions are usually assigned at the school level, although the intervention takes place at the level of the teacher, classroom or individual child, and effects are measured at the level of the child. Nutrition interventions, for example, can be assigned at the community or sub-district level. Given the kinds of large-scale programmes supported.